Radioisotopes play an integral role in the imaging and treatment of certain types of pediatric malignancies, notably differentiated thyroid cancer (DTC) and high-risk neuroblastoma. 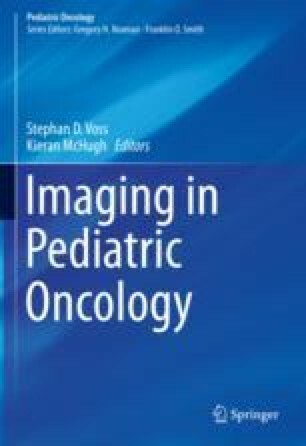 This chapter focuses on radioactive iodine (I-131) therapy of pediatric DTC and I-131-metaiodobenzylguanidine (131I-mIBG) therapy of high-risk neuroblastoma. The epidemiology of pediatric DTC and the current status of I-131 therapy including the recommendations from the recent pediatric guidelines of the American Thyroid Association (ATA) are outlined. The role of diagnostic whole-body I-123 scintigraphy and dosimetry in guiding I-131 therapy is also discussed. Treatment-related considerations including outpatient versus inpatient setting, patient preparation, education, and radiation safety considerations are reviewed. This chapter also includes information on the epidemiology of neuroblastoma, as well as the background and current status of 131I-mIBG therapy in this disease. Logistics of establishing a 131I-mIBG therapy program and the process of safe delivery of 131I-mIBG to high-risk neuroblastoma patients are discussed in detail. Side effects of therapeutic 131I-mIBG are also outlined. Finally, a concise overview of novel radionuclide therapies such as peptide receptor radionuclide therapy, radionuclide antibody therapy, and palliative bone-seeking radionuclide therapies is presented. U.S. Nuclear Regulatory Commission Regulatory Guide 8.39. Release of patients administered radioactive materials. 1997. Available at www.nucmed.com/nucmed/ref/8_39.pdf. Accessed 10 Oct 2017. United States Nuclear Regulatory Commission 2008 Standards for protection against radiation. Title 10, Code of Federal Regulations: Part 20, Subpart C—20.1201 Occupational dose limits for adults; 20.1207 Occupational dose limits for minors; Part 35, Subpart C—35.75 Release of individuals containing unsealed byproduct material or implants containing byproduct material. Available at www.nrc.gov/reading-rm/doc-collections/cfr. Accessed 10 Oct 2017.